The National Writers Series and Front Street Writers offers a variety of creative writing workshops for students of all ages. Students participating in these workshops are invited to submit to the National Writers Series Literary Review. Published annually by the Writers Series of Traverse City, the National Writers Series Literary Review showcases the writing of students, grade school through adult, who have taken NWS writing classes/workshops. Our writing workshops are instructed by publishing professionals, published authors, and educators. Meet at Building 50 in the yard in front of Cuppa Joe each afternoon. Wear shoes for hiking and exploring! The best scary stories are filled with eerie suspense and creepy details–and our own State Hospital can provide plenty of both. What does the witch see through her one good eye? Where do ghosts go in the morning? Just what is that thing hiding in trails behind the hospital? 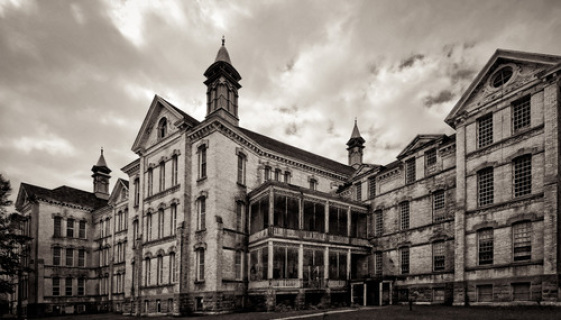 Trail hikes, a tour of the hospital and the tunnels, and lots of interactive writing exercises will help you write your most bone chilling tale yet!